I got a call last year from a young, well-traveled couple getting ready to build on a gorgeous tidal creek lot on Johns Island. 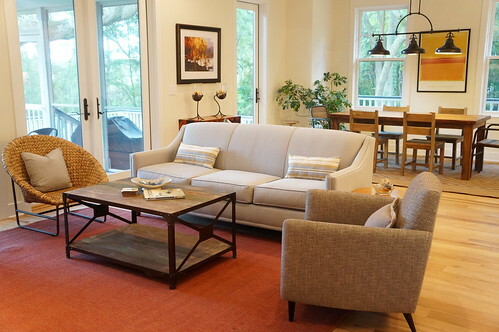 They wanted their new home to be minimal, dog friendly and have an overall laid back feel. They have acquired great pieces of art through their travels and from family members. And best of all, she is not afraid to pull something from the side of the road or a trash bin and reclaim it! So with that said, they had some great pieces that served as the inspiration for color and style. 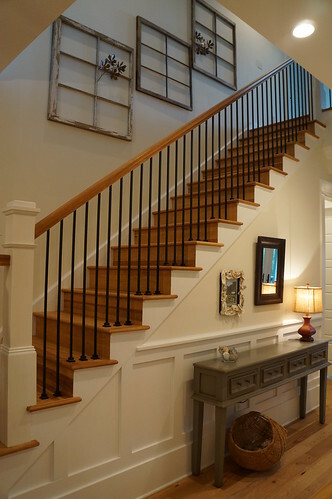 Walking into the home, you’re greeted by a beautiful staircase. Up the steps, we used old window frames to adorn the wall (Antiques Market). I added some copper leaf accents to add a little more interest. 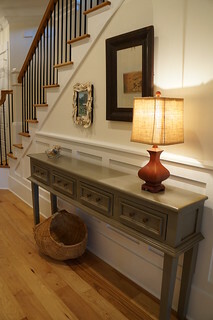 Below is a long console table from Nadeau with drawers great for storage. The mirror is turn-of-the-century and the oyster frame was made by the owner. The basket underneath is great for the dogs toys. In the back of the house is the open living area. I wanted to keep the focus on the beautiful scenery outdoors, so I kept the walls very light and airy. The pops of red were inspired by the artwork, so I carried it throughout the downstairs. The couch is from Morris Sokol, woven chairs are from Pottery Barn, accent chair from Crate and Barrel and the coffee table is from Nadeau. All of the rugs are from Rug Masters. As you can see, we left the windows untouched to maintain the view outdoors. 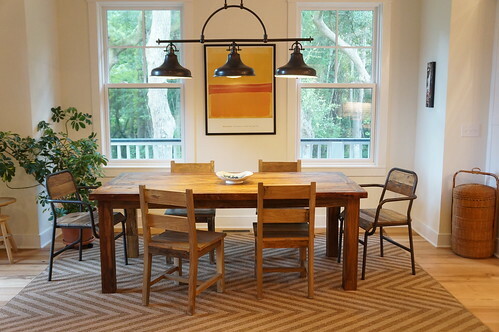 We used indoor/outdoor rugs throughout the home as well. We brought in an industrial touch with the light fixture we found on sale at Charleston Lighting. The teak table is from Nadeau and the chairs were ordered online. The handmade stool was a “throw away” find by the homeowner and the stacked baskets are vintage. In the master bedroom, we used a soothing gray with a hint of blue for the walls (Sherwin Williams, silver strand). We did add blackout shades here. 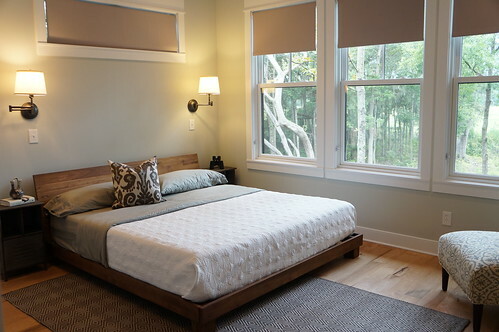 Everything is kept very minimal with the platform bed (Crate and Barrel), lighting and seating. I off-set the rug for some added interest. 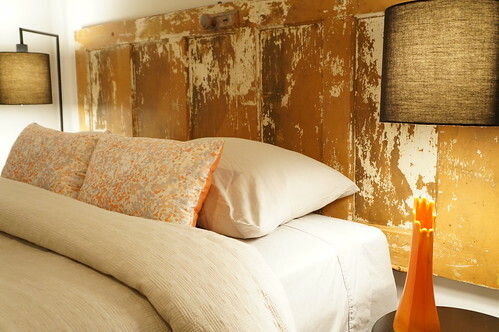 In the guest room, we used a salvaged door as the headboard (Antiques Market). 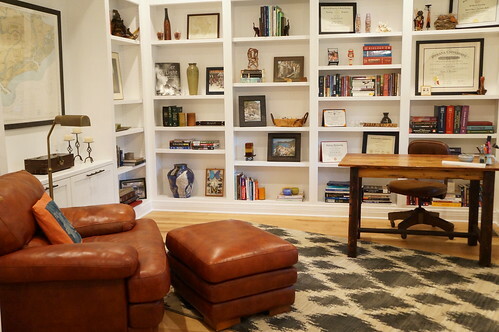 We kept the office simple by using their own leather chair and ottoman. The floor lamp is another “find” by the owner. The desk was a silent auction win and the desk chair is vintage. The shelves are home to their collection of books, multiple diplomas and pictures and souvenirs from their travels. Oh and I love this rug! Rooms don’t always have to be overloaded with decoration to look great, sometimes simplicity is better. Get creative with ways to use color and texture. And a cool secondhand find will ALWAYS add personality.